The European Space Agency’s Rosetta spacecraft, launched in 2004, has just gone into hibernation until 2014, as it continues to cruise towards its far-flung rendezvous with a comet. Once there it will drop a lander on the nucleus and then accompany the comet as it orbits towards the Sun. Before Rosetta went to sleep, its camera OSIRIS was able to pick out its target, Comet Churyumov-Gerasimenko,160 million kilometres away among the background stars. This is the picture released today from the Max Planck Institute for Solar System Research (MPS). 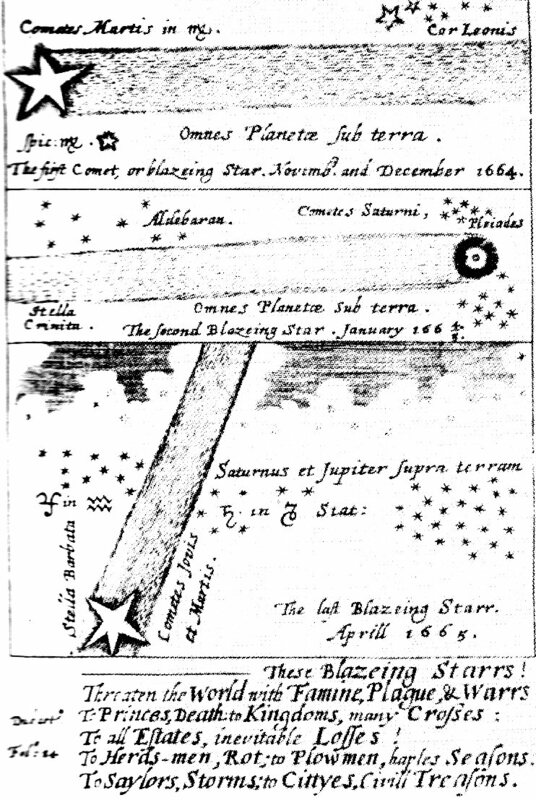 Caption: Seen in the second enlargement from the crowded starfield of the Scorpius constellation, the comet became visible as a single point of light to the 10-cm OSIRIS telescope on Rosetta, thanks to exposures totalling 13 hours. Credits: ESA 2011 MPS for OSIRIS-Team MPS/UPD/LAM/IAA/RSSD/INTA/UPM/DASP/IDA. “We had not expected to be able to create first images from so far away,” says the lead investigator for OSIRIS, Holger Sierks of MPS. By the way, next week (15 June) I’ll be taking part in an ESA TV programme about Rosetta and its predecessor Giotto, at ESOC, ESA’s mission control in Darmstadt. Soon to be published is the discovery of 14 new members of the Solar System in the so-called Kuiper Belt beyond the most distant “real” planet, Neptune. They are 40-100 km leftover scraps from the building of the Sun’s family of planets. To find them, a team from the Harvard-Smithsonian Center for Astrophysics and Northern Arizona University, led by Carlos Fuentes, trawled through existing images from the Hubble Space Telescope. As Halley’s Comet and 15 other regular visitors came from the trans-Neptunian Kuiper Belt, I suppose I should be updating my Comets book, but although it mentions “Halley-class” comets orbiting not far beyond Neptune, it doesn’t name the Kuiper Belt. That important feature figures in Magic Universe, which was written two decades later and is more receptive to updating on this point. Here’s the most relevant section in the story called “Comets and asteroids: snowy dirtballs and their rocky cousins”. Pascale Ehrenfreund rides again (as in Part 2) in the story in Magic Universe called “Life’s origin: will the answer to the riddle come from outer space?”. But please focus first on Wlodzimierz Lugowsky. ‘I can trace my ancestry back to a protoplasmal primordial atomic globule,’ boasts Pooh-Bah in The Mikado. When Gilbert and Sullivan wrote their comic opera in 1885 they were au courant with science as well as snobbery. A century later, molecular biologists had traced the genetic mutations, and constructed a single family tree for all the world’s organisms that stretched back 4 billion years ago, to when life on Earth probably began. But they were scarcely wiser than Pooh-Bah about the precise nature of the primordial protoplasm. In 1995 Wlodzimierz Lugowsky of Poland’s Institute of Philosophy and Sociology wrote about ‘the philosophical foundations of protobiology’. He listed nearly 150 scenarios then on offer for the origin of life and, with a possible single exception to be mentioned later, he judged none of them to be satisfactory. Here is one of the top conundrums for 21st Century science. 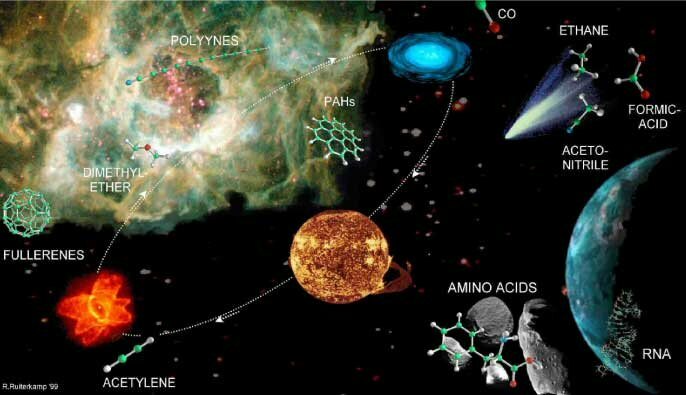 The origin of life ranks with the question of what initiated the Big Bang, as an embarrassing lacuna in the attempt by scientists to explain our existence in the cosmos. After discussing possible “home cooking” of life by hypercycles, RNA catalysis or lipid catalysis, and touching on the possibility of false starts, the tale turns back to the sky in pursuit of the only hypothesis acceptable to Lugowsky. I promised more to come, and here it begins. Part 2 deals with cosmic carbon compounds. Later, Part 3 will reconsider the initiation of biochemical action, and Part 4 will look at suggestions of natural life footloose in space. There were far more comets around when the Solar System was young, in the “heavy bombardment” phase of Earth history lasting until 3.8 billion years ago. Water is abundant in interstellar space and available to build the icy nuclei of comets. Comets may have delivered most of the Earth’s surface water, essential for life. Carbon compounds are the other main ingredient for life. Comets’ tails consist mainly of small dust grains released from the nuclei, including grains laden with carbon compounds that may have contributed to the origin of life on the Earth. Here’s a general impression of important “prebiotic” molecules made in the vicinity of dying stars and newborn stars and available for incorporation into comets.